Like most common names, "Slate-Winged Olive" can refer to more than one taxon. They're previewed below, along with 3 specimens. For more detail click through to the scientific names. These are sometimes called Slate-Winged Olives. This intriguing species has received a lot of attention in past angling books. Recent authors suspect that much of this credit was a case of mistaken identity, with Attenella attenuata receiving praise for the hatches of Drunella lata and Dannella simplex. Much of the credit was legitimate and accurate, but this species is no longer thought to be on par with its most popular cousins in Ephemerella and Drunella. I have several specimens listed under this species, but I'm not positive the identification is correct. This species is very similar to Drunella flavilinea. In areas where their ranges overlap, they can sometimes be found in the same streams. Allen and Edmunds (1962) say that Drunella coloradensis tends to favor colder water than Drunella flavilinea and that it may emerge as much as a month later. These are very rarely called Slate-Winged Olives. When Selective Trout was first published in 1971, Swisher and Richards included Drunella lata (Small Blue-Winged Olive, Slate-Winged Olive) as a Midwestern "superhatch." Although it can also be found in many Eastern trout streams, it is probably more important to Midwestern anglers. 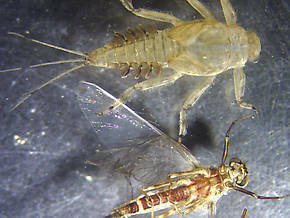 Typically a morning emerger, this species often competes for the attention of trout with more abundant Tricorythodes and small baetids during parts of July and August. 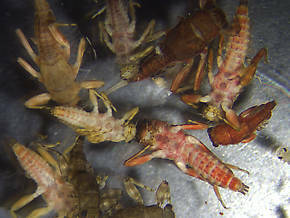 For this reason, the authors of Selective Trout considered the concentrated evening spinner falls to be more important than the somewhat sporadic morning emergence. 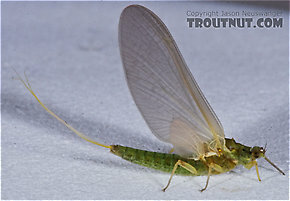 From an angling standpoint, this situation is nearly the opposite of the earlier Drunella cornuta emergence in the East, where the morning emergence is usually the main event and spinner falls are often of little consequence. 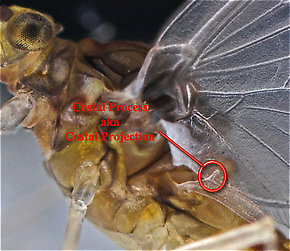 Conical mesonotal projections: small cone shaped spike sticking up from the top and front part of the middle thorax segment.